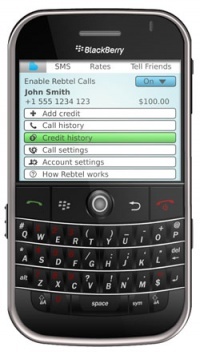 Overview: fg’s BlackBerry SIP VoIP Client is a feature rich soft phone application for BlackBerry devices. It can register to any SIP VoIP provider or IP/SIP capable PBX using a WiFi connection in office, campus, home, hotel rooms, public hot-spots etc. Its much like having a BlackBerry desktop phone in your pocket, providing significantly higher overall productivity while at the same time lowering telephony costs. Experience the freedom of choosing your own VoIP provider whenever you want, wherever you want. All you need is a WiFi network and a VoIP account. Go to Preferences > Profiles. Position focus on existing profile, press menu item “Create copy”. Type in your new profile name. Select your new profile, press menu item “Active” or press trackball/touchpad. You will be asked if you want to log in or not. Choose NO. Go to Setup > Main Settings. After you save your settings you will be asked if you want log in. Choose YES. If your settings are correct you should be logged in when you come to main screen, if not go to 7. and try again.